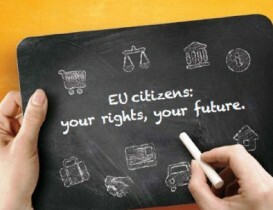 The European Commission has published new Eurobarometer on EU citizenship and the electoral rights that come with it. The survey shows that more Europeans (87%) than ever are familiar with their status as EU citizens. The report also shows that a similar number (88%) thinks that the EU should give citizens a stronger voice in democratic decision-making, an advocacy long defended by the European Civic Forum and other civil society organisations. The respondents also showed their interest in playing a more active role in the European political life, which would not be limited to European elections. Online consultations and other dialogue mechanisms were notably quoted several times. The Flash Eurobarometer on EU citizenship was conducted in October 2015 among 26,555 citizens in all 28 Member States. The European Commission took the opportunity to reiterate its commitment to ensuring that EU citizenship rights translate into concrete added-value for European citizens. This entry was posted in General on 31. March 2016 by Heckeberg.